It has been a while since I’ve posted anything about my colouring books, so I thought I’d make an update. I’d hoped to have my next book out by now, but sometimes things just take longer than expected! At the moment I have two books that are both about halfway complete. One has easy kawaii drawings, and the other is a doodly abstract book, but with more detail than my last one. I’m really happy with the work I’ve done on them, and am looking forward to finishing and getting them out there! I’m also making some rough sketches for the next book after those, which will have a flower theme. I get bored if I’m just working on one book all the time, so I need to mix it up a bit. 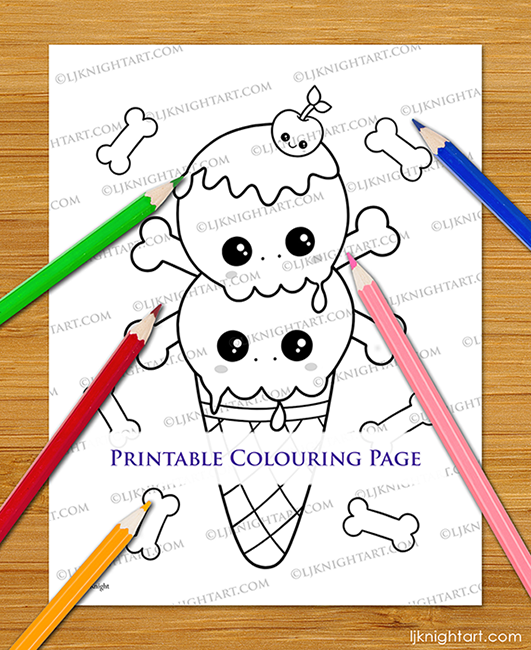 I do have one page from the kawaii book in my Etsy store – this cute skull ice cream cone. I won’t be releasing any more single pages until the book is finished, but this gives you an idea of what’s coming. Click here to see it on Etsy. It’s now just over three years since I started making colouring books, and while I still love doing the drawings, I got a bit burned out on the publishing process last year (updating and republishing all my books under my new author name in the space of a few weeks didn’t help!). So I’ve slowed down on the production a bit, and going forward I’ll be spending more time on other types of art too – finished pieces, wall art, some designs for cards and other products, and whatever else I feel like. I’m in a bit of an experimental phase, trying out new media and techniques. Most of this will never see the light of day, but I’ll post some things if I like them enough. This entry was posted in Books & Colouring, Updates and tagged Colouring Books, Colouring Printables, Kawaii.